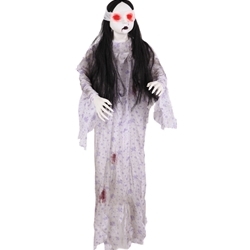 The bloody doll in pj’s Halloween decoration features a child size doll wearing bloody night gown. The dolls eyes light up red. The bloody doll in pj’s Halloween decoration is colored as pictured. Decoration stands and measures 3 feet tall. Requires 3 “AG13” watch batteries (not included).